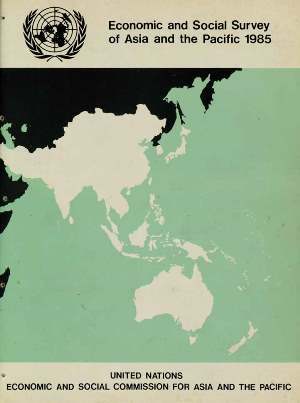 This is the thirty-ninth annual Economic and Social Survey of Asia and the Pacific (until 1974 entitled the Economic Survey of Asia and the Far East). As in previous years, the Survey 1985 is presented in two parts. Part one contains a survey of recent economic and social development in the region in the context of the world economic situation. Part two is devoted to an analysis of international trade, trade policies and development in the countries of the region. Economic growth in the developing economies of Asia and the Pacific was generally less robust in 1985 than in 1984, though the region’s performance remained stronger than that of other regions. In general, economies which are reliant on endogenous stimuli for growth and nurtured under sound principles of economic management fared better. The slow-down was most marked in export-oriented economies hit by protectionism and slipping demand for manufactures and extremely low prices for primary commodities. In regard to the latter, the island economies of the Pacific, the least developed countries and several others dependent upon depressed commodity markets were severely affected. Some growth was achieved in the region’s least developed countries although there was no increase in the net inflow of resources from abroad. Generating stronger stimuli for self-sustaining growth remains an important concern across the region, and improvements in the international environment would facilitate and hasten the achievement of this objective. Initiatives to foster healthier international financial conditions and a more stable exchange rate regime have been taken since late 1985. It is expected that these initiatives will be pursued vigorously and will help bring about increased inflows of capital at lower interest rates to improve the growth prospects of developing countries everywhere. Among problem areas in the international environment, perhaps the most important to developing countries in the Asian and Pacific region, is that of trade. Part two examines the experience of developing member countries in their efforts to expand, diversify and otherwise promote foreign trade, and analyses both statistical material and policies relevant to trade, trade policy and development. A brief appraisal of selected institutional arrangements for trade promotion in the region is also presented. The conclusions of these analyses have direct relevance to policies in countries in the region for the development of their domestic economies and the expansion of their international trade. Like previous Surveys, this issue is published on the sole responsibility of the secretariat and the views expressed herein do not necessarily reflect those of the Governments of the members and associate members of the Commission.